From turtles and orcas to dolphins and sharks, most divers dream of catching sight of these impressive animals in their natural habitats. Here’s a look at some of the world’s best destinations for divers keen to discover these extraordinary species. The Pacific coast is a prime destination for rewarding dives. While snorkelers can cruise the Whitsunday Islands and hang out with the famous fish called Elvis, divers can swim among loggerhead sea turtles off the coast of Moreton Island. Together with the neighboring Fraser Island, Moreton forms the largest sand structure in the world. However, it’s still a relatively secret destination since neighboring Fraser Island is the main draw for thousands of tourists keen to visit the world’s largest sand island. The Ecuadorian archipelago is a paradise for nature-lovers thanks to its extremely rich biodiversity. Some 2,909 marine species have been identified in its waters, of which 18% are endemic. In short, the islands promise divers an unforgettable experience. While marine iguanas are the usual must-see when diving in the Galapagos, sportier types can head off a little further to find sea lions, silky sharks, spotted eagle rays, manta rays and sperm whales. 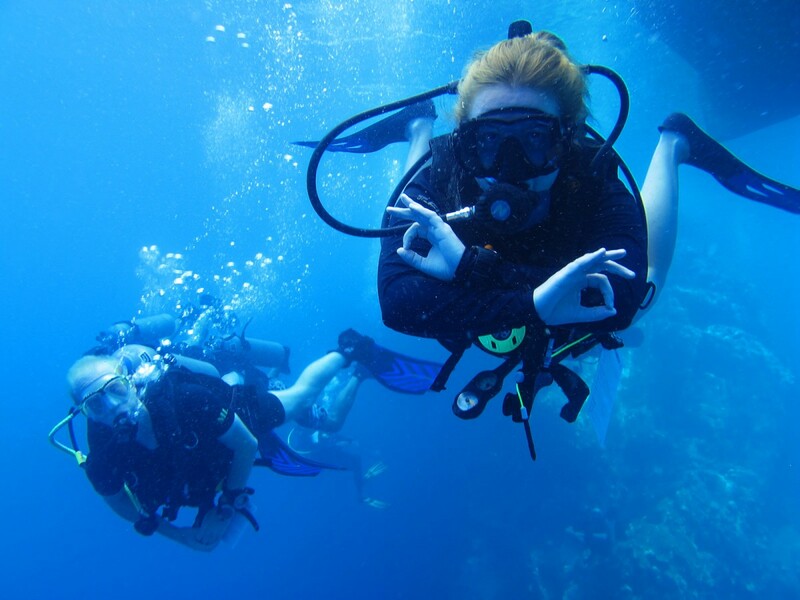 Scuba divers don’t need to stick to warm water adventures. Northeast of Saint Petersburg, the White Sea offers a spectacular sight thanks to its population of beluga whales. These intriguing white whales have a distinctive melon-like protuberance on the front of their heads. The curious creatures sometimes even pop their heads up out of the water to see what’s going on around them. You won’t see belugas in summer, though, as they migrate to warmer waters. Often thought of as dangerous predators, killer whales, or orcas, can be easily approached by divers when at ease in their natural habitat. In the waters surrounding Norway’s Lofoten Islands, whale-watchers can set off in search of the creatures from November to February, but don’t bring any tanks, as bubbles will scare the whales away. Organized night dives (with scuba tanks) are also available for a particularly moving experience. Experienced and adventurous divers can head out in search of the blue shark in the waters of Portugal’s Azores islands. Certain rules must be followed to keep divers safe while observing the sharks under the water, even though this species doesn’t instinctively hunt humans. Divers in search of a more laidback experience can still enjoy the Azores, however, since the islands are one of the world’s largest whale sanctuaries. It’s relatively easy to catch a glimpse of toothed whales and sei whales, for example. Divers can get up close to the world’s biggest fish, the whale shark, in Zanzibar or the Maldives. This endangered species is harmless to humans and can be observed in the wild, so long as you follow the rules in place to protect it. Divers will need to head to the whale shark’s favorite haunts, notably lagoons and estuaries, where it feeds on shrimps, plankton and anchovies. Tanzania is a well-known destination for divers thanks to its stunning multicolored coral reefs. As well as the dolphins that follow alongside diving boats, visitors can look for humpback whales during the species’ migration period in August and September. French Polynesia is home to various species of shark, such as the blacktip reef shark, the whitetip reef shark, the lemon shark and more. The hammerhead shark is one of the star sights of Polynesian waters, so long as you visit between November and March. A dive of around 15 meters is necessary to catch sight of the species. The shark usually hangs out at depths of around 50 meters, but it can swim up if it spots suitable prey. Note that the species is considered not dangerous to humans, though care should be always taken.